It was hard work, climbing the long, one and a half mile road up to the Briksdal Glacier, near Olden in Norway (see blog entry dated 17th May 2012). Constantly out of breath, legs aching we struggled on, with the tumbling river on our left. We were relieved when at last the road levelled out and the going became a little easier. We swung along now, our breathing more regular, but aware that with the next turn in the road all that could change, and the path could go steeply upwards again. And that was why we made our big mistake. Ahead was a signpost pointing off along a path to the right. The sign said ‘Kattanakken’, and there was a little picture of a stick man with a rucksack. Now you must agree with me, it looked a bit like a short-cut. I could see two men a long way ahead following the path already, and another couple were about a hundred yards along, so we decided to follow them. I won’t say that my friend chose the path, but she certainly didn’t disagree! The path was wide and clear, and the going was easy, almost like walking in a meadow. After a couple of hundred yards it got a bit more bushy, but the path was still very obvious, and covered with mossy white stones, like large, fist-sized pebbles. The path wound into a straggly wood, and gradually became steeper, and the pebbles underfoot had mutated into rocks; but we could still see the way ahead quite clearly. Between the rocks the ground was becoming a bit boggy, and was strewn with dead twigs and branches. The thin scrubby trees grew closer together, and grabbed at our clothes as we passed. And as the path got narrower, and more difficult to follow, there was a faint niggly worry at the back of my mind; but we had come too far to think about turning back now. The path meandered on through the wood, over uneven rocks, round clumps of skinny trees. It was less well-defined now; where on earth were we going? We could see the couple ahead, so we put on a spurt and finally caught them up, just as we emerged from the trees. We had reached a rocky outcrop, and the path had completely vanished. The rock was steep and smooth, mossy in places, and striated by the movement of ice in times gone past. We clambered round the edge, and up onto the top of the rock. Below us and to the left was the river, and on the other side, behind a wire fence, we could see people walking along the roadway. But there was no bridge, and we could see no clear way to cross over the river and join them. We carefully made our way down over the rock to the edge of the river. The other three went upstream, and I went downstream. The river wasn’t too wide, but it was running quite fast, and there was no obvious place that would be easy to cross. There was a line of three largish rocks jutting out into the water, but then there was a gap, with no rocks clear of the water. Ah well, I must give it a go. I clambered on to the first rock, stepped carefully onto the next, and then onto the third. I was now in the middle of the river, but where to go next? The water was quite deep, and flowing quickly, and was much too wide to jump in one go. About halfway between me and the far bank, I could see a rock about an inch under the surface of the water, but I had no way of knowing if it was stable, or would shift as soon as I put any weight on it. On the far side was a large rock that I could end up on. There was only one thing to do, I prayed, and then I leapt for the submerged rock, hoping it wouldn’t move. I landed as lightly as I could, and bounced straight off and onto the rock on the far side. The submerged rock held firm, and I made it, hardly getting my feet wet! But where was my friend, had she crossed higher up, or was I going to have to go for help? I called. No reply. I tried my mobile, but the signal was poor, and in the bright sunlight I could barely see the screen anyway. Then I saw her, still on the wrong side of the river. The couple had crossed further up, I don’t know what happened to the two men, or another two who had been behind us. I guided my friend to where I had crossed, and encouraged her to do the same as I had done. She was worried about her camera getting wet, so I told her to throw it across to me first. Then she leapt across as I had done. There was then only a short scramble up the slope of the river bank, and past the end of the barrier and up on to the road. We had made it! We had lost a lot of time on our little detour, but we decided that we still wanted to get as near the glacier as we could. 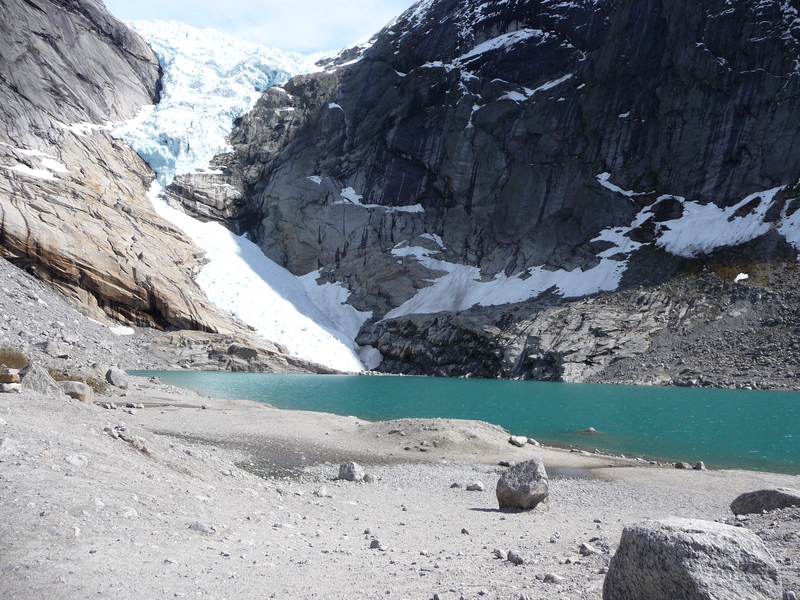 We quickly walked the rest of the road up to the little green lake, above which the glacier hung like a frozen river of ice. It was simply magnificent. We drank in the scenery for a few minutes, but time was pressing on, and we didn’t want to miss the coach! We decided to go the ‘proper’ way back, and followed the road! When we arrived at the signpost where we had turned off, we took photos of the sign! We got back with just enough time for a well-earned cup of coffee and cake. When we were back on the coach, I showed the guide the photo of the sign, and asked her what it meant. She said that it literally meant ‘cats neck’. And I knew why; the rock we had climbed over definitely had the shape of an arched cat’s neck!